Yesterday’s Inch of the Day was a mark-making experiment using a tool I’ve had for a while and never used. It’s a bleach pen. I’ve altogether forgotten its original purpose, but the idea of using it dropped into my head a couple of days ago. I was astonished at what I found I could do with it. There’s lots of potential here. I’m looking to find ways of expressing forces and energies, especially those which bring something into being, which is to do with my Below the Line Project. These really are inchies, as they’re each one inch square. The inchies on the top left are those I drew on with the pen. The bleach formed a paste on the fabric. I laid a sheet of kitchen roll on top and ironed it. I then washed the pieces and ironed them dry again. I like the idea of a pen that takes something away (in this case, dye) in order to make a mark, instead of adding something (like a pencil). Have you made any art using a bleach pen? Any tips and techniques? I’d like to know. 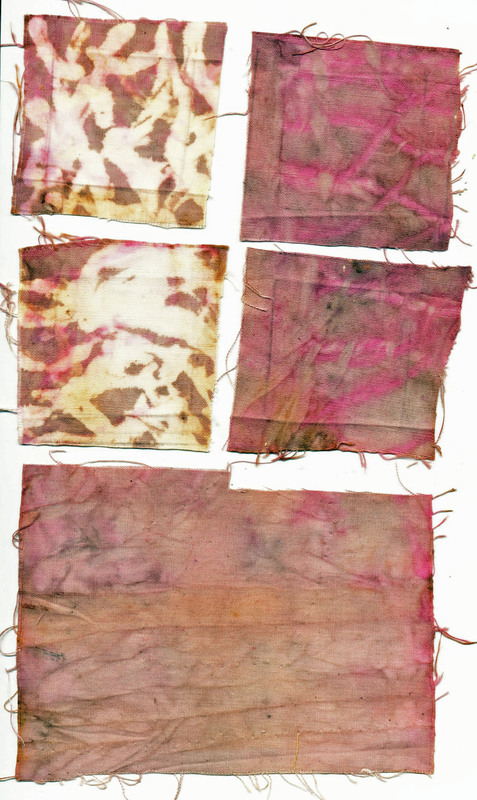 This entry was posted in Art, Drawing, Eco/Natural Dyeing and Printing and tagged Bleach Pen, Forces and energies, Inchie. Bookmark the permalink. Very cool! Looks almost like bamboo (the shapes). Love it! What will you do with your inchies? Hi Kat. Well, I’ve been sketching down some ideas. (See today’s post). Suggestions always welcome, of course!